Arizona is finally through with living in Nevada’s shadow, the state now plans to license sports gambling. 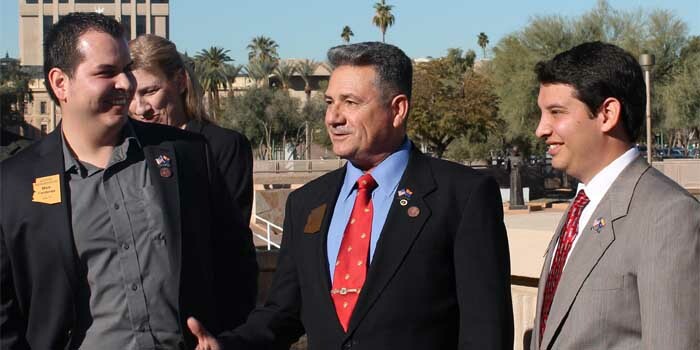 Republican Senator Sonny Borrelli introduced Senate Bill 1158 at the Arizona State Capitol which contains provisions to allow sports gambling to be operated by domestic federally-recognized native tribes with tribal gaming compacts. Sports betting would be available in Arizona casinos, bars, private clubs, sports stadiums, horse tracks through special sports gambling kiosks. The bill would allow tribes to offer sports betting not only in casinos but also in certain establishments that have a bar or beer and wine licenses through tribal-owned kiosks placed there. Sen. Borrelli’s hope is that more rural Arizonans will be able to access sports gambling options through these peppered kiosks outside of native reservations. For which establishments are eligible for these kiosks, Borrelli told local news reporters that “Those licensed liquor establishments would be able to have that kiosk in their establishment, so a patron could place a bet”. Any revenue made from domestic sports gambling would fall into existing tribal revenue share agreements. Those wagers placed in casinos would directly fall under revenue share agreements, wagers made in kiosks outside of casinos will be subject to an entertainment tax of 6.75% and then be sent to the tribe’s revenue share agreement. The bill’s current language only allows those 21 and older to bet and makes wagering on collegiate sports illegal. The Arizona Department of Gaming would be the state’s primary agency for regulating domestic sportsbooks. Sen. Borrelli has reassured many that his bill isn’t forced on any vendor, tribe, or venue, as he was quoted saying, “[The bill], respects the tribal compact and their sovereignty, and they can opt in or opt out. … It’s all permissive. If they do not want to put that kiosk in a local bar away from the casino, that’s totally up to them and, obviously, the bar owners”. Sen. Borrelli says he has gotten support from the local tribes, bar industry, and nonprofits like the Elks and American Legion. The way the bill is written proceeds received by the state from the tribes and the entertainment taxes will be allocated to the state’s General Fund. The bill will receive its hearing on Thursday at 9:30 am. Sen. Borrelli has confidence in his bill making it to Governor Ducey’s desk. AZ Governor Ducey expressed interest in sports gambling legalization last year when the Supreme Court repealed PASPA and tweeted his hope of bringing domestic sports gambling to Arizona on the social network Twitter not long after. Arizona Attorney General Mark Brnovich also cheered at the Supreme Court’s decision. Mark Brnovich was the former Director of the State Department of Gaming. Many local gambling venues are excited to introduce sports gambling as an addition to their menu options, including the Armadillo Grill on Camelback in Phoenix owner Brenda Lambrecht who said, “We already have the infrastructure here with the off-track betting, so I’d like to see it come to an establishment like mine”. Many local venues are already planning to embrace sports wagering as a way to drive up foot traffic and profits.